Irish crochet is an interesting technique that creates a more dimensional finished piece. It is traditionally worked where the stitches are made over other stitches or threads. 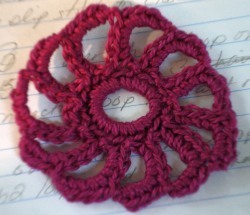 The extra bulk in Irish crochet will lead to motifs that are a bit sturdier and this flower could easily be attached to others to create a pretty scarf or cloth. 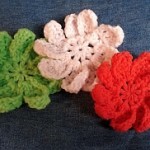 This free crochet flower pattern uses two basic techniques common to Irish crochet and could easily be used as the basis for a doily or other larger pattern. 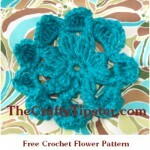 The pattern works with crochet thread up to an all-purpose 4-ply acrylic. With crochet hook, carefully grab the yarn and pull through ring to create a loop on your hook. Make 1 sc to secure the ring of 5 loops in place. Work 20 sc into your 5 loop ring. It will be a tight fit, so slide your stitches around the ring to avoid crocheting on top of the first stitch and to spread the stitches around the ring evenly. (Be careful not to make the 20th stitch looser than the others.) Slip stitch to the 1st of your 20 stitches, ignoring the initial single crochet you made to secure the loops of your ring which will disappear under your stitches. Chain 8, into 3rd chain from the hook make 1 sc. Holding the ring and the chain between your thumb and palm (this next bit is something of a wrestling match and it might take you a few tries to find the positioning that works best for you), work 7 sc over the chain – over the chain like you did over the loops from your finger. Skip the next stitch on the ring and slip stitch onto the ring. 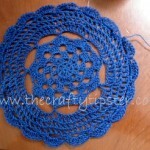 Chain 6, slip stitch into the 4th stitch on the last petal, work 4 sc over chain 6, slip stitch with end of 1st petal. You will need to make 4 more sc on the last petal. This is a bit awkward, but then again, it was only 4 stitches. (I ended up making the stitch through the loop by grabbing the yarn through the gap.) Skip a stitch on the ring and secure with a slip stitch and end off. 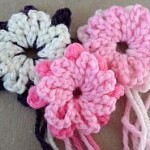 Finish the crochet flower pattern by working the end down to the ring and hiding it under the stitches of the initial 6 stitch ring. Use a slightly smaller crochet hook to help avoid stretching the stitches out of place.